EcoVia MT Mosquito & Tick Control is among the latest of Rockwell Labs’ research-based botanical insecticides, featuring naturally derived active ingredients. It is exempt under the Federal Insecticide, Fungicide and Rodenticide Act (FIFRA) 25(b) provision. EcoVia MT is designed for use in compressed air sprayers, mist blowers and foggers to deliver quick kill control and residual repellency for optimal mosquito and tick management outdoors — and in unfinished indoor areas such as attics, basements, garages and sheds. Its concentrated formula results in low use rates (0.33 ounces per gallon for mosquitoes and deer ticks), and can be fogged over water with no set-back. Like other FIFRA 25(b) products, there are no notification requirements (recommend verification with your state regulations), and no pyrethroid application restrictions. 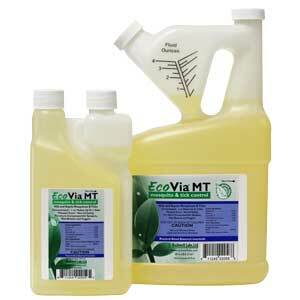 EcoVia MT’s water-based formula will not leave behind an oily residue and is available in a 16-ounce squeeze-n-measure bottle and a 64-ounce tip-n-measure bottle. This Green Zone product is suitable for green service programs.